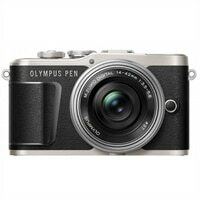 Olympus PEN E-PL9 KIT with 14-42MM LENS, 16GB CARD and Case - BlackWe get it. You love your phone. But if you want to be a social media standout, raise your visual game. Introducing the PEN E-PL9. It has everything to produce images you’ll be proud to post. There’s nothing to learn; just pick it up and let the on-screen guides and built-in settings make every shot perfect. Unlike using a phone, your shots and video will look crisp and smooth thanks to our image stabilization system. Compact, stylish and available in a range of colors, it looks as amazing as the photos it captures. Features like a flip touchscreen, built-in flash, and Wi-Fi and Bluetooth for easy sharing make the E-PL9 your go-to camera for shots that will make your friends and followers take notice.